The second generation Suzuki Swift debuted at the Paris Motor Show in September 2004. The design of the new Swift was previewed on the Concept S and Concept S2 concept cars at auto shows, in the years leading up to its launch. This generation of the Swift marked a significant departure with the previous Cultus-based models, with Suzuki redesigning the vehicle as less of a "low price alternative" subcompact and more of a "sporty" subcompact The Swift's design and driving characteristics focused on the European market with its chassis refined through a road-testing program across Europe. The Swift was available with 1.3- and 1.5-litre petrol engines, rated at 92 metric horsepower (68 kW; 91 hp) and 102 metric horsepower (75 kW; 101 hp), respectively. It was produced in Hungary, India, Japan, Pakistan and by Chang'an Motors in China. In Japan, only the five-door body is available, and four-wheel drive is an option for the 1.3- and 1.5-litre petrol engines. A 1.2-litre engine fitted with an automatic continuously variable transmission (CVT) transmission was offered as in front-wheel drive only. In Europe, the Swift was launched in three- or five-door hatchback forms, with 1.3- and 1.5-litre petrol engines, and a 1.3-litre DDiS engine supplied by Fiat. The 1.3 petrol is also available with an automated manual transmission or with four-wheel drive. Suzuki Swift Sport 3-door (Germany).The second generation Swift has received a four stars out of five rating in the Euro NCAP crash tests. It also was awarded 2006 Semperit Irish Car of the Year in Ireland. 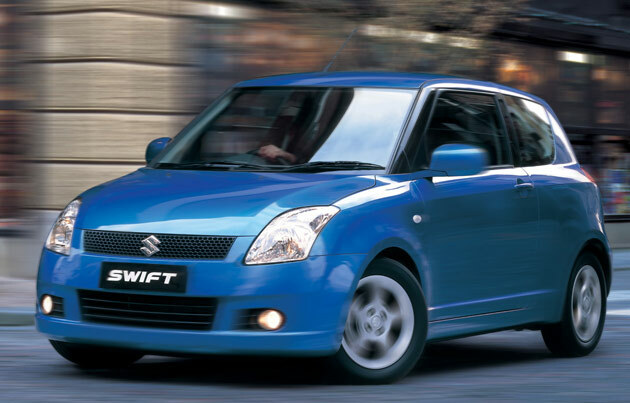 In October 2005, Suzuki launched the Sport version of the new Swift in Japan, and in September 2006 the model was introduced in most European markets. Named "Swift Sport", it is powered by a high-revving 1.6-litre, naturally-aspirated DOHC VVT four-cylinder engine with a 11.1:1 compression ratio, high lift cams, forged pistons, and strengthened valve springs. The 1.6-liter engine produces 125 metric horsepower (92 kW; 123 hp) 148 newton metres (109 lb·ft) torque. The Swift Sport features sportier bumpers and spoilers, a stiffer suspension, twin exhaust pipes, red sport seats (with Recaro seats optional) and four-wheel disc brakes on 16-inch wheels. The European Swift Sport features manual transmission, the three-door body variant, 17-inch wheels and electronic stability control (ESC).